The wood stair treads and handrails of your staircase are likely some of the most often used and most neglected things in your home. Stairwells are not that simple to clean, and you may find that dirt builds up easily, the finish rubs off and there are dents and scratches. 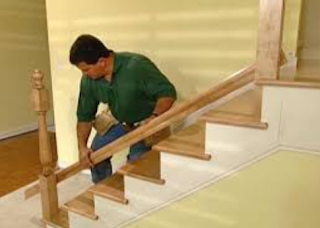 Luckily, refinishing a handrail and stair treads is just like finishing any other wood in your home, and a fairly simple process, as long as you have the right materials and a few hours to accomplish the project. 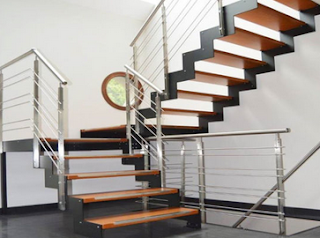 Keep in mind that your stairs should not be used during the duration of the project, so do your project at a time when your children are at school or napping. Before you can refinish the stairs and rails, it's crucial for you to clean them well. Use a mild cleaner and sponge to wipe everything down very well. Clean the sponge out regularly with clean water and wipe the rail down again. Ensure that you remove all cleaner before you start the refinishing process, and let the wood dry naturally before beginning the next step. Adhesive painter's tape is important if you want to keep from staining any areas that shouldn't get a stain on them. Lay newspapers down around your stairs to guard against drips from the stain you'll be using. Additionally, protect yourself by wearing a mask to prevent the inhalation of fumes from the materials you will use. You will need to next sand the railing and the steps well. It is recommended to use a handheld electric sander, and after that finish up with a fine grit paper to hit any rough spots. Follow the grain of the wood as you sand down the finish to the bare wood is revealed. Then sand the rail once more with ultra fine sandpaper in order to make sure that you are smoothing out any and all rough spots. Then clean the handrail once more to remove any excess sanding dust. You can begin to do the actual staining once you have finished all sanding. Make sure that your can of stain is well shaken and mixed before you actually open it. Then, dip a rag in the stain and squeeze it out while wearing gloves. Begin applying the stain to the handrail and wood stair treads proceeding in the direction of the grain of the wood. Keep on until all wood is covered, then wipe the stain off and repeat the staining process once more. Keep repeating the process until the wood gets to a color that you like. After the stain has totally dried, apply a polyurethane coat to seal the finish. You need to apply two or more coats of the sealant, and you will need to allow it to try completely between each and every coat. The final coat of this finish will need to dry for at least 24 hours before the stairs can be used again. Once the sealant has dried thoroughly, it is fine to remove the painters' tape. As soon as everything is done, get ready to enjoy a set of stairs that looks updated and brand new again. 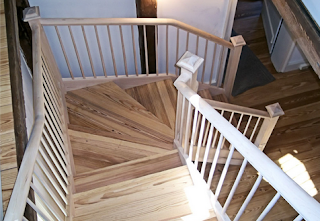 Make sure you complete your project at a time when your stairs are not made use of to avoid getting dirt and other particles into the stain or finish. With the right preparation and the right timing, your staircase will appear brand new with little effort on your part.